Posted by Chris on Wednesday, December 29th, 2010, at 2:00 am, and filed under Knitting. Very pretty socks. Do May and Chaos go nuts over wool? Shelli rolls around on it and tries to eat it. Oh wow! Socks! Excellent colour choices. Mayhem and I both approve. Very good with the matchy-matchy. PS – Magellan will awake from a coma-like state if you bring apples to his cage. 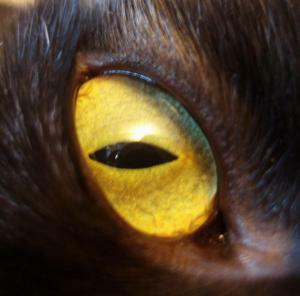 For a second or two I was terrified as May’s claws were clearly visible, but it looks as if no damage was done. Good kitty!! I do love the color and I absolutely love the kittie in the picture. I want the kittie and the socks! You did an awesome job honey!!! OMG! Socks! Stripey socks! Matchy stripey socks! The world is ending! Oh… maybe it’s just the year that’s ending. Chris- I did see those on Ravelry. Such wonderfyl purply stripiness. I will not have an aneurysm because you are actually showing knitting content. I will not, because my blog has been devoid of the knitting lately too. I feared to read this post in case May’s sharp claws and teeth had wreaked havoc on the stripey socks. Whew! 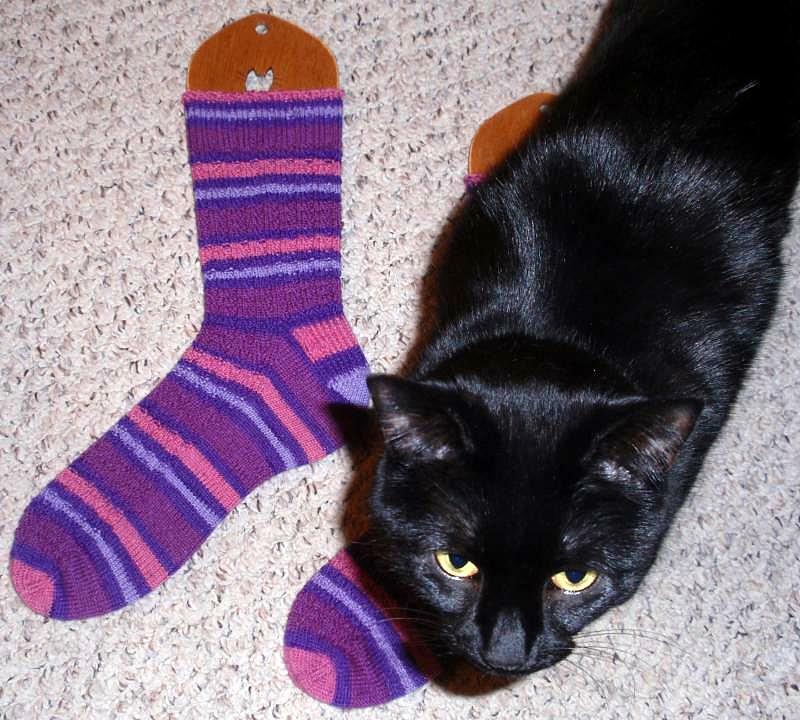 Apparently you have a friend who like purple stripey-ness as much as you do. Great socks! Cats like to try out anything placed on the floor, I’ve noticed. At least he didn’t rip them to shreds :). I think I’m going to have to sue you. I just fell out ofmy chair and onto the floor over the shock of knitting pictures. I may demand as full settlement the cats. p.s. I really like the socks, the recipient very lucky! You did a fantastic job on those socks. You should be proud! Yay for stripey socks! May knows a good thing when she sees it. Or steps on it. Or kneads it. Great colors, too! Happy happy New Years! 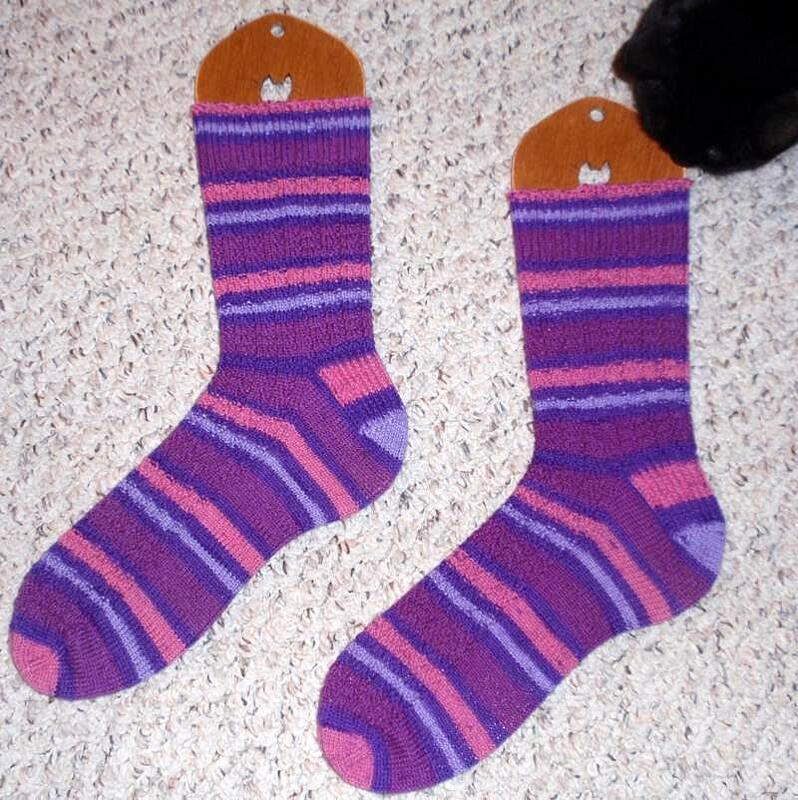 I’m impressed – finished socks! 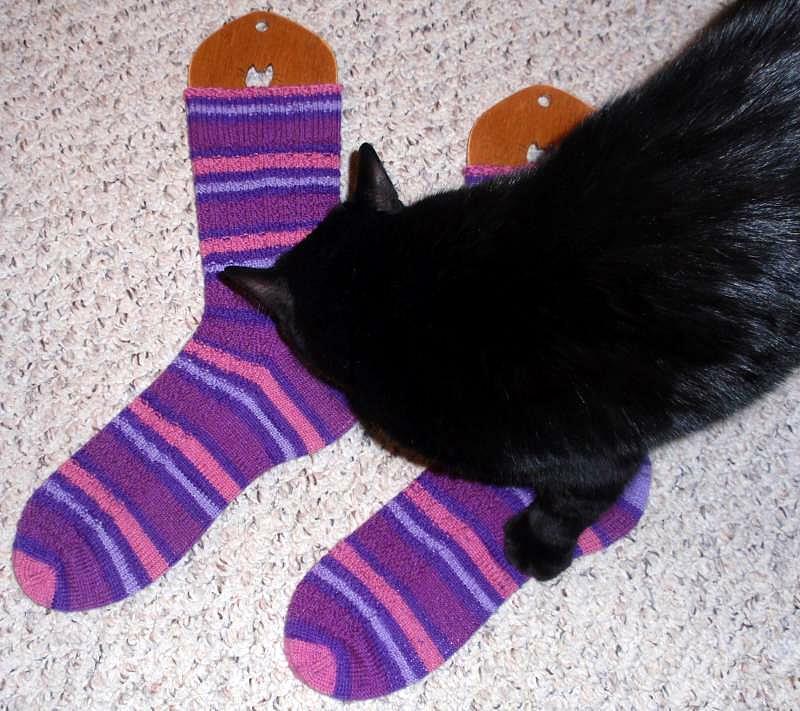 nothings better than kitty approved socks. WOW!! Very impressed. I went through a phase of knitting scarfs…but never socks. Knitting! 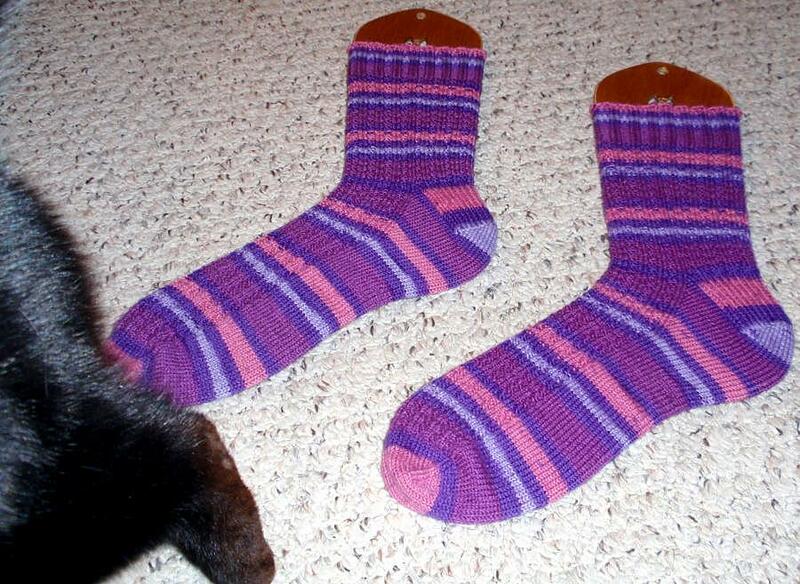 Nice stripey socks, with matching stripes too! It’s good to see they got the Mayhem vote of approval. Best socks ever! I luv them too Mayhem! Pretty, pretty colors. Very nice! Always good to see stripey socks on your floor. Knitting? I thought you’d given that up! 😉 And May seems to prefer stripey socks to naughty boys! A recent post from janna..Merry Christmas! I love that they’re a Mayhem magnet. Knitting??? *falls over* hee hee! I feel slighted not to have received such a gift as this! Wondered – do you keep that pristine-looking piece of carpet specifically for photos – otherwise – where are the cat hairs?! !